At U.S. Patio Systems and Home Remodeling, we offer high-quality replacement bathtubs to residents of Minneapolis, Minnesota, and the surrounding suburbs. 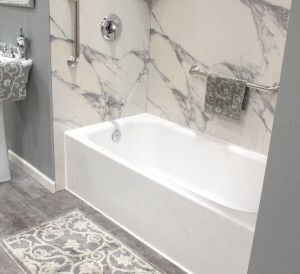 Our selection includes replacement tub systems from industry leader Bathwraps, which manufactures durable acrylic tubs that provide a luxurious look and feel and are a better value than metal, porcelain, or fiberglass tubs. Bathwraps replacement bathtubs are available in an assortment of shapes, colors, and sizes, and can be customized with several accessories. With so many options to choose from, you’ll have the opportunity to select a tub that perfectly accommodates your bathing needs and style preferences. One of the driving factors behind our decision to offer Bathwraps bathtubs for bathroom remodeling projects in and around Minneapolis is their acrylic construction. Acrylic is a nonporous material that is perfectly suited for the manufacturing of bathtubs, shower pans, shower wall panels, sinks, and other areas of the bathroom that frequently come into contact with water. In addition to offering traditional tubs, U.S. Patio Systems and Home Remodeling is the exclusive dealer of Safe Step Walk-In Tubs in Minneapolis, MN, and the surrounding area. With features like heated seats, therapeutic jets, anti-scald technology, and leak-proof doors, Safe Step Walk-In Tubs are designed to meet the bathing needs of senior citizens and others with restricted mobility. Contact U.S. Patio Systems and Home Remodeling to request more information about the high-quality bathtubs that we offer to residents of Minneapolis, MN, and beyond. Be sure to ask about the convenient financing options we have available for qualified homeowners.